The Council has traditionally protected the area adjacent to school entrances with ‘School Keep Clear’ and the associated zig-zag road markings, and these are supported by Rule 243 of the Highway Code which states ‘Do Not stop or park near a school entrance’. However, these markings are supportive of the nationally recognised offence of causing unnecessary obstruction, and enforcement was by the Police and their Traffic Wardens, which is based on one of opinion, which unfortunately can be subject to interpretation and frequently to challenge. This has resulted in the widespread abuse of the markings. 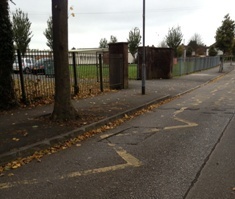 A request has been received from ward Councillors and the School’s Traffic Management Safety Group for the introduction of Traffic Regulation Orders indicating ‘No Stopping’ and associated ‘School Keep Clear’ and zig-zag markings in order to prohibit the widespread indiscriminate and dangerous parking or stopping at these locations during the school day. The proposal is therefore to introduce a No Stopping Monday to Friday 8am – 4.30pm restriction in the form of School Keep Clear and zig zag lines near the school entrance as shown on the attached plans. These restrictions may be enforced by Civil Parking Enforcement Officers.